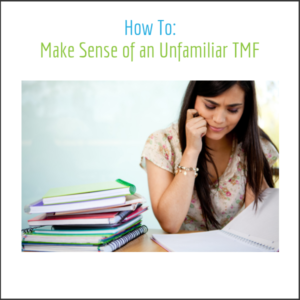 How: How do I approach an unfamiliar TMF? Participating in the creation of a TMF from start-up to close-out is a serious advantage. Being present for and participating in the major milestones of a clinical trial greatly assists one in understanding the structure and health of a TMF. Unfortunately, though, in the fast-paced environment of clinical research, rarely are TMF stakeholders afforded the opportunity to see a study from beginning to end. Often, those contributing to a clinical trial (and its TMF) join a study on an ad-hoc basis after a trial has begun and are assigned to specific tasks in a narrow role. Without firsthand, high-level experience of a trial, how then, do those assigned to an in-progress study gain the knowledge necessary to support their contribution to the TMF? Embrace the Reference Model: In the first post of this how to series, we discussed the TMF Reference Model in detail. We chose the Refence Model as the first how-to topic because of its fundamental importance to every TMF professional and every TMF. The cardinal inspiration of the Reference Model is transferability—to allow TMFs and their stakeholders to move between projects and companies with minimal effort. If your new TMF uses the Reference Model, your prior TMF experiences on other Reference Model TMFs will greatly flatten the new-project learning curve. Understand the TMF Format: Is your new TMF paper, electronic (eTMF), or hybrid? Are there any plans to perform any kind of migration between formats or eTMF systems? Obviously an electronic vs. paper TMF will be the overarching factor that shapes your TMF experience, however, the story of why or how your TMF came to be in a certain format can greatly assist you in planning your contributions and setting realistic expectations. Ensure Proper Access: Whether paper or electronic format, access challenges are at the root cause of many common TMF dysfunctions. Don’t waste the precious on-boarding time your team provides struggling to secure full access to the TMF: your first objective when assigned to a new TMF should be ensuring you understand what steps must be taken to gain and maintain access. Trace the Workflows: For all TMF formats, despite the complexity of features or nuances of physical document handling, a few core workflows will define how stakeholders interact with the TMF. Before focusing on higher level tasks, make sure you’ve mastered the role of a typical end user. All TMF systems have a basic filing workflow, as well as ‘move’ and ‘delete’ functionality. Understanding how to accomplish these simple tasks efficiently will be necessary to engage in higher-level TMF administration. Study the Protocol: A healthy TMF should tell the story of a clinical trial. The first chapter of that story is your clinical trial’s protocol. The information contained within provides a wide range of information that will determine the structure of the TMF: information about the study design, recruitment, assessments, and timelines. As the study revolves around the protocol, so too will your new TMF. Gain Confidence with Key Submissions and Approvals: After understanding the basic function and structure of your TMF and studying the protocol, seek out key regulatory and ethics committee approvals to track the progress of the trial after start-up. Key events like protocol amendments, new ICF versions, site additions and changes, as well as alterations to patient facing materials can be found in submission and approval letters. These letters (especially initial approvals) may even have bulleted lists of submitted documents, including version numbers and dates. By tracing the rhythm of submission and approval, you can quickly bring yourself up to speed with the trial’s current team. What: What do all TMFs have in common? Success Is eTMF Agnostic: All of our TMF tips are relevant whether or not your TMF is in electronic format. Before becoming overwhelmed or preoccupied with the elements and features of your new study’s eTMF, have confidence that the key elements of the TMF’s foundation don’t depend on technology. Your know-how, attitude, and team are worth more than any eTMF feature. Focus on Fundamental Functions: Walk before you run. TMF experts love to talk about the prospective project-management elements of the TMF. Although a modern TMF can be a powerful trial management tool, it still is, above all, a document repository. Understanding how documents enter the TMF and how they are classified is of the upmost importance. The TMF Tells a Complex Story: Clinical trials are complex, and the story of the trial evolves overtime. Expect that your new TMF might take a while to learn and that the TMF’s health may not be ideal. The TMF belongs to no singular person and its health can only be impacted through united effort and incremental changes. Having a positive, flexible, and sustainable mindset is more important than your level of experience or technical competency.